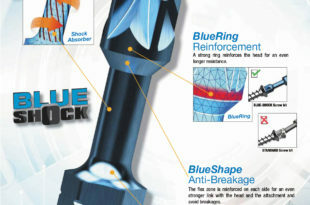 The torsion bit is excellently suited for cushioning load peaks. If, for instance, the screw head makes contact with a solid metal surface, a torsion bit will master this situation without any problem. The load peak is cushioned by the torsion zone, thereby avoiding permanent distortion or deformation of the bit point. metal piece but also in sheet metal. 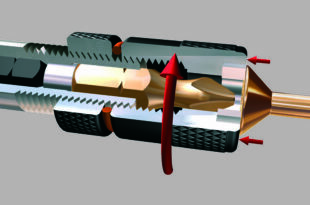 The fl at underside of the screw head comes into contact with the fl at, non-elastic surface of the solid metal piece which results in a sudden load peak. Due to the low torque, which is required for fastening a screw, the different forces, which come into effect are extreme. Another case of “hard” fastening relates to self-tapping screws fastened in a solid metal piece but also in sheet metal. Also in this case, a sudden load peak occurs, but the difference of forces that act on the components is not as extreme as in the application described above. In this case, the advantage of the higher torque, which can be transmitted by the torsion bit, plays an important role. Furthermore, torsion bits are superior to standard bits when screws are to be fastened into layers of materials with different degrees of hardness, where alternating loads, which are similar to load peaks are encountered. USH uses the self developed High-Speed-Cold-Forging process for the manufacturing of screwdrivers. The bit is given its shape by means of cold forging That manufacturing process gives the bits high precision, greater mechanical strength and a very clean surface condition. With a double titanium layer a surface hardness of 3,000 Vickers is obtained in the case of ISOTIN® bits (standard TIN bit approx. 2,500 Vickers). By an optimised multi-stage hardening and tempering process under vacuum, the bit achieves a core toughness, which is demonstrated by the torque which is up to 120% higher than that of uncoated bits (compared to a Ph 2 bit as per DIN standard). Optimised core toughness and a thicker wearing coat give a longer tool life than that of a TIN bit with standard coating. As a result of the torsional shape, the bit is suitable for all delicate applications in both hard and soft materials. DiaTin bit is in effect a torsion bit provided with a TiN (titanium nitride) coating. An additional DLC (diamond like carbon) coating is applied to the TIN coating. This special coating in the engaging area of the tip ensures a high degree of grip between the bit and the screw which clearly reduces the cam-out value. In combination with the torsion form, the bit is suitable for challenging applications for both hard and soft screw fastening.